The art of weaving is an ancient art. Long before the popular Navajo rugs were woven, the Navajo people were weaving clothing and ceremonial items to be worn. The Shalako Kachinas are the Giant Couriers of the Rainmakers. They have no arms and the masks of these ten-foot figures are carried on poles by their impersonators. The Kachina has no religious significance in the Navajo culture. 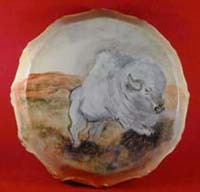 Navajo craftsmen have borrowed from other cultures for centuries but do not always follow the techniques of the Hopi's. 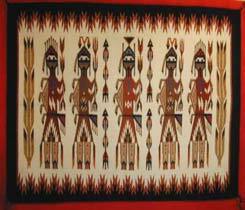 There are collector's of both the Navajo and Hopi version. These are beautiful hand carved wood Chickens. A must for any collector. 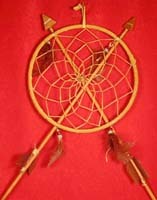 The Dream Catcher was hung near the bedroom window to catch dreams. The bad dreams would get caught up in the webbing, held there until morning light, then burned off. The good dreams were caught and held in the feathers to return another night. The most important Native American instrument is the drum. The basic construction is: a wooden frame or a carved and hollowed log, with buckskin or elkskin stretched across the opening with sinew.